I have a great friend who will spend $5,000 on a new handbag. Fine clothes and accessories are her “thing”. My thing was, is and always will be food. There have been a couple of times I’ve spent close to $800 on a dinner for two. If anyone can get me into French Laundry, I’d pop the money to go there. It’s the equivalent of buying Super Bowl tickets for me. I appreciate and talk about food the same way an art collector gets excited about a Picasso. 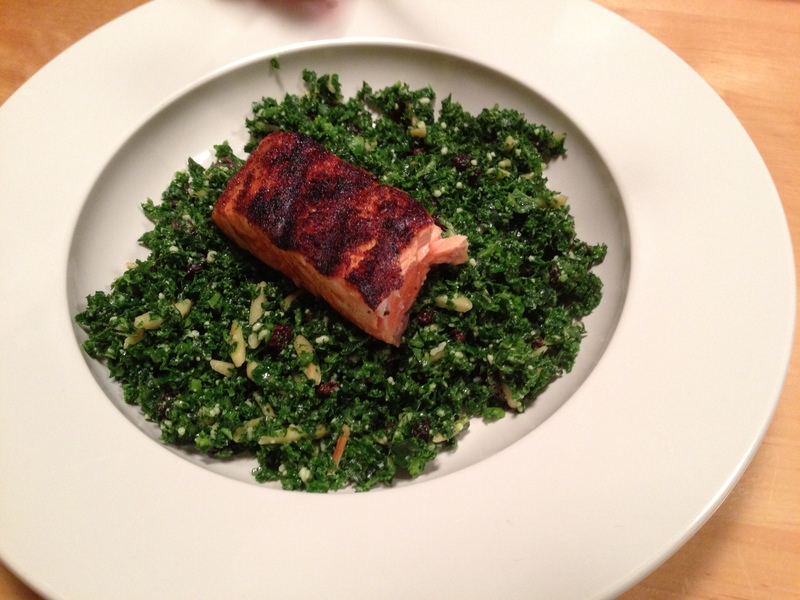 Recently, I have started cataloging all of my recipes with an iPhone App called Recipe Box. This will allow me to always have my recipes in my back pocket, and I can email any recipe with a touch of a button. Whenever I experience a dish worth making at home, I ask the server to get me the recipe. Most of the time, the chef will just share an overview of the recipe. I then go home and try to make it myself. I must brag and tell you my reverse engineering success rate is fairly high. A few months ago, I made roasted cauliflower with a smoked pea truffle pesto. There’s this great locally owned restaurant called The Tavern that serves a cold kale salad. They take the raw leaves, sans stems, and pulse it in the food processor. The kale is the consistency of sawdust. They then add in toasted slivered almonds, currants and parmesan cheese. They dress it with lemon juice and olive oil. It is fantastic. I usually order mine with a piece of grilled salmon. Below is a pic of my reverse engineered recipe. It was incredible and the leftovers were just as good. 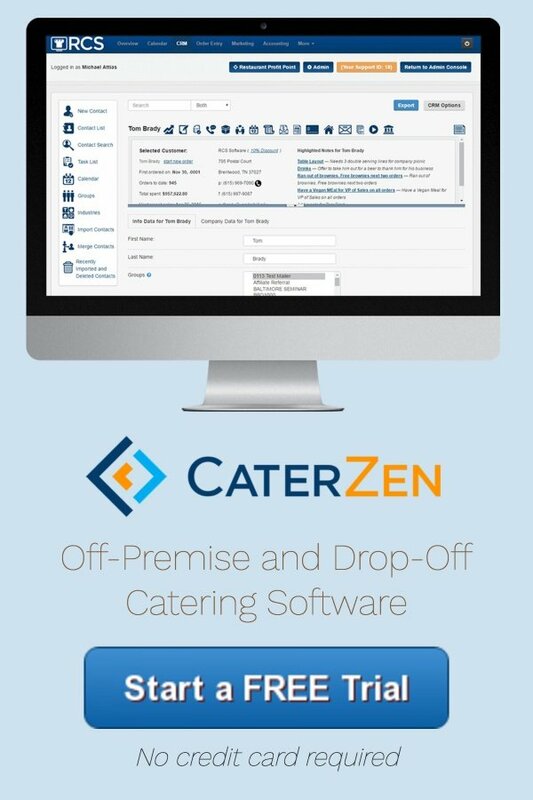 How can you use reverse engineering to build your catering sales? Years ago when starting out I realized success leaves clues. Niche marketing is the ultimate reverse engineering tactic. I think the epiphany started in 1993. I remember getting a large drop-off catering on Black Friday from a large retailer at the mall. Being a dude, I had no idea what Black Friday was. I called the contact at the retailer and received an education. I just catered a ________ type of event for _____________. (Black Friday for a major retailer). If so, who do I target and when? 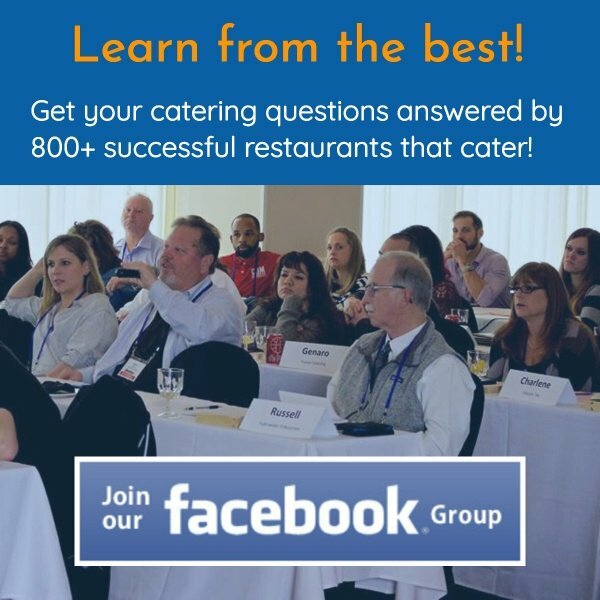 Create a marketing letter/strategy to get more catered events from this niche. So in the example above, I figured out other retailers catered in meals for their hard working associates on Black Friday. I knew I could drive around each major mall/shopping center in Nashville and build my own list to target. This was pre-internet. I surmised the decision maker was either the HR director of the store (department stores) or the store manager. I sent the letter out about a month before Black Friday, and then called each store to follow up. Yes. Some times I had to make multiple calls and was asked to follow up. Other times I was sent to an assistant manager or key admin. I saw a large opportunity that took about $45 in mailing costs and some time on the phone…in the afternoon during my down time. Unless you are a one man hot dog cart, you have an hour each afternoon to unplug, leave your store and market. The bottom line is $6,000 in drop-off catering sales for that Black Friday. I have had many other members use this strategy with success. I used this reverse engineering strategy to get a ton of pharm rep business. Playing detective led me to discover there was a Middle Tennessee Pharm Reps Association. I sponsored their calendar. It had a listing of all the members. I sponsored a meeting and fed them all and gave them beer to drink. They in turn indirectly contributed to my kids’ college fund. Niches are everywhere. It is the low hanging fruit of building catering sales. Does it take work? Does it require more energy than watching Family Guy? Yes and yes. It beats the alternative…sitting, waiting for customers to grace your dining room with their presence. There is no excuse in this country for not succeeding. Opportunities abound. Will this blog article be a bitter tasting lemon or a tool to make lemonade…to sell to construction workers on a hot July day? The ocean cares not whether you show up with a thimble or bucket to take it away.